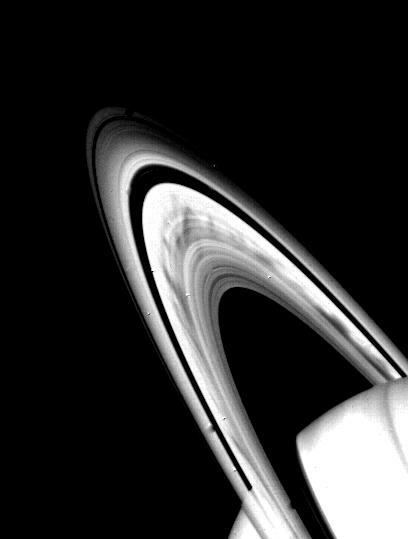 Prominent dark spokes are visible in the outer half of Saturn’s broad B Ring in this Voyager 2 photograph taken on Aug. 3, 1981 from a range of about 22 million kilometers (14 million miles). The features appear as filamentary markings about 12,000 kilometers (7,S00 miles) long, which rotate around the planet with the motion of particles in the rings. The nature of these features, discovered by Voyager 1, is not totally understood, but scientists believe the spokes may be caused by dust levitated above the ring plane by electric fields; Voyager 2 photography of the rings edge-on, scheduled for Aug. 25, 1981, will provide an opportunity to test that theory. Because the Sun is now illuminating the rings from a higher angle, Voyager 2’s photographs reveal ring structure from a greater distance than that seen by Voyager 1 in its November 1980 encounter. The Voyager project is managed for NASA by the Jet Propulsion Laboratory, Pasadena, Calif.